The dial color on this new Nomos model is perfect. There is nothing more to say (but we will anyway). The grey numerals are outlined in a blue and really stand out against the galvanized, ruthenium-plated dial of the Campus Nacht. 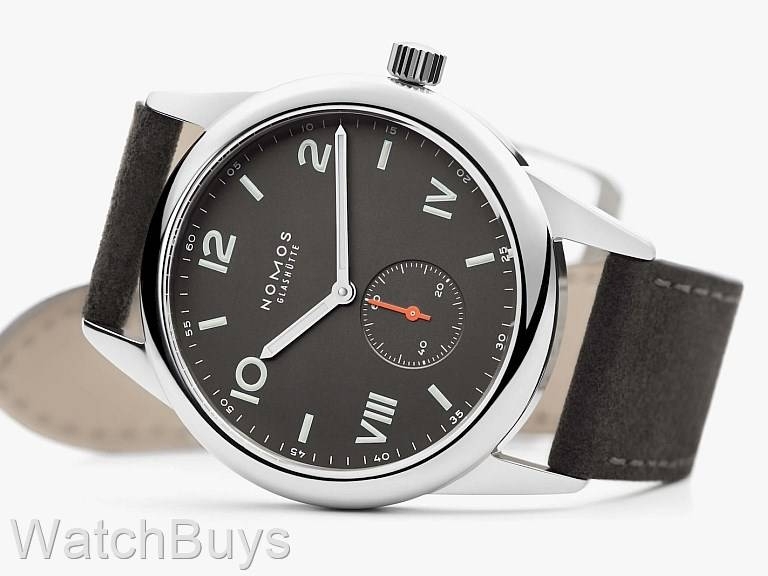 "Amazing Entry Level Dress Watch"
Verified Owner Comments: I had been curious about Nomos watches for some time and decided to give one a try. I bought the entry level manual wind Campus Club and was pleasantly surprised by the quality, subtle design and time keeping accuracy of this thin light weight pwerhouse. The 38.5 size is perfect for my 6 3/4 wrist. Looks even better on a shell cordovan strip. My only complaint would be the lume, or lack thereof. very weak. Something I can live with.